Here’s something new–my first guest post on this blog. 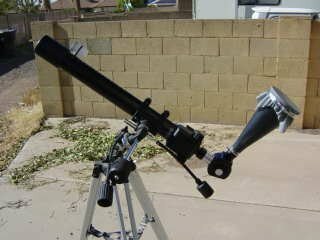 It’s by frequent commenter David DeLano, whose DIY astro gear I have featured here once before. 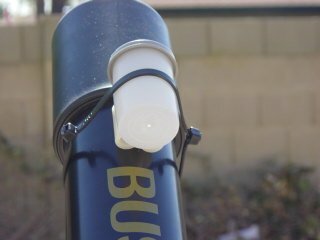 David puts a lot of thought into equipping and fine-tuning his scopes to get the best performance possible, and you can see that attention to detail in his sun funnel writeup. He sent this as an email message with permission to post. It’s pretty much as sent, with just one or two additions to clarify things that were already familiar to me from our email conversations. 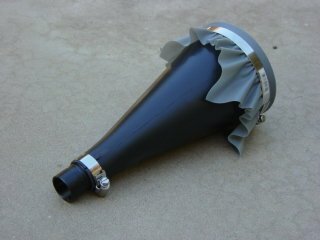 The sun funnel parts list and instructions are here and here, and I previously mentioned it on the blog here. Enjoy! Here are some experience points worth noting. It was cool to have an EQ mount, even as light as this one is. 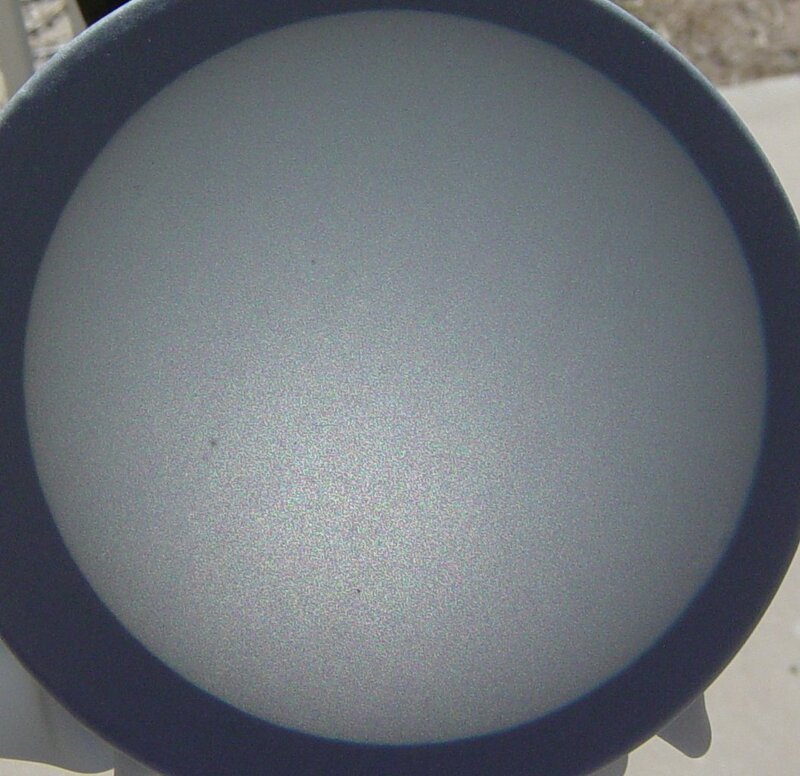 I had to do some tweaking on it, and it took several brain sessions to get it aligned properly, but one I got it configured, it helped to be able to tweak one knob to follow the sun. It moves fairly quickly. You get maybe a minute to look at any specific thing before you need to adjust the view. I also had to tighten the Alt down most of the way. This setup is very heavy on the EP end. I had to slide the scope a bit back to clear the Alt micro stem, which made it even worse. I need to find a counter weight to put on the front of the tube. When you mount the screen on the funnel, make sure the back, inside, is as clean as you can get it. I had an annoying spot on mine, and I ended up taking it apart, cleaning it, and putting it back together. One of the directions says to put the shiny side inside the funnel. I agree. This side is easier to clean, as it’s slicker. 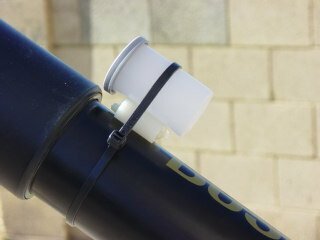 Try to keep the clamp as close to the top as you can, as it will want to slip down as you tighten. After a while, though, the grabbiness of the cloth will keep it in place. Pull the cloth down from under the clamp as you go, and try to eliminate any creases. After a while, the sliding down will just tighten. I tightened mine until I could ping the top like a drum. I don’t have a shade yet, but what I’d suggest more is a shade umbrella or tent. A beach umbrella clamped to the mount, or even a chair would be nice. It gets hot observing the sun. In fact, this is probably conducive to sitting in a chair to observe anyway, since you don’t have to be hunched over the EP. 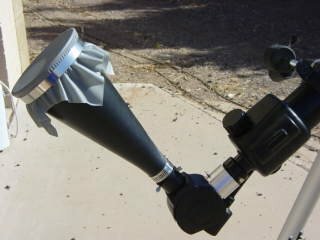 The only part of the scope that got noticeably hot was the front of the funnel, from the outside, not the inside. Pardon the leaves…that’s another project for this week. This is a Bushnell 50mm F12.5. The ideal EP is around 17.5mm, but the closest I have is 15mm (OWL), and it works fine. Note that this diag is either 90* or 45*. I didn’t try 45*, but that might be nice for sitting in a chair. Something finally worked and was darn easy. I took a clear-ish film canister, with a grey lid, and punched a hole in the center. This was the hardest part. I used my centering punch to fight the little nib and get a hole a close to the center as possible. (If you don’t have one of these, get one. They are cheap, and you can use them for all sorts of things. You put the point where you want to mark and press down. It’s spring loaded and will “pop” when enough pressure is applied. You are under control up until the pop, so you can’t miss making a small indent exactly where you want it. Pop it several times to make a deeper dent. I use this for starting screws, getting a drill bit to start where I want, etc.) I ended up with a bit if a smile hole, but in testing it worked. I did go back up and clean up the hole with a 1/16″ bit. I bought two nylon spacers, zip tied them together, punched holes in the bottom of the finder, and put the spacer set on with a zip tie. I zip tied the assembly to the end of the scope. Notice the dot of light on the back of the canister in the second picture. The film canister finder works very well. I has some movement, but it really easy to align. It didn’t need to be shimmed, only twisted by a minute amount. This is actually the second one I made, and I tucked the first one away and am not quite sure where. The hole is just punched. It looks like it’s overkill to drill the hole out. I keep a cap on the end of the EP when not in use. I’m not sure where/how I’m going to store this, as it’s relatively large. Note that this looks like you are looking inside something. But, it’s a flat surface. You can make out some sunspot activity about halfway out from the center to the left. 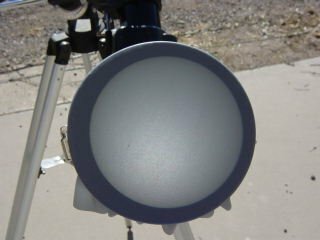 I’ve looked through solar scopes before, and this setup shows most of the details that I’ve seen in those scopes, though the scopes can zoom. The surface of the sun even roils in this view. One note – don’t try to focus on the edge of the sun, as it’s moving. Try to pick an interior detail if possible. Now, some close-ups so you can see the real deal. This is a big picture–click to thermonucleate! 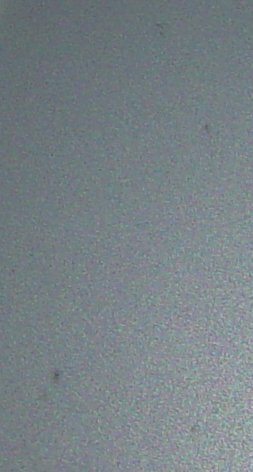 The dark fleck about an inch up from the bottom is a speck on the back of the screen. You can easily see three sunspots, and in fact, I could see six. At one point I thought I saw a brief flare, but it didn’t last very long. 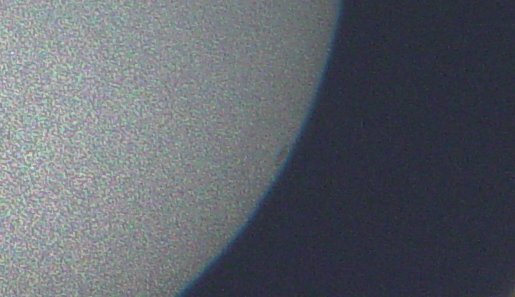 There is also a nice sunspot on the right edge, that you can see better in the next pictures. I left the fleck out of the picture so that it isn’t confused as solar detail. 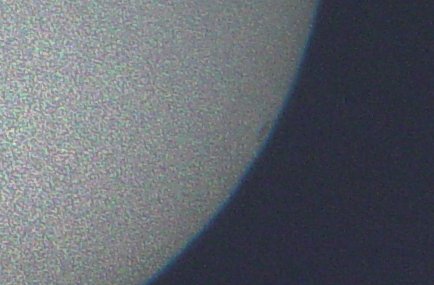 Here is a cut of the sunspots that are on the left side of the picture. One question that might be asked…how do you know the other spots aren’t on the screen. Well, for one, they move with the sun as it goes across the screen, and second, they can be focused. Anything on the back side of the screen is always in the same spot, and always in focus. Many thanks, David, for a very clear and compelling writeup, and for permission to share it here. Now I want to build one more than ever. Thanks, David, for sharing your experience. Rick Fienberg just wrote some additional instructions to address common questions and comments from users. 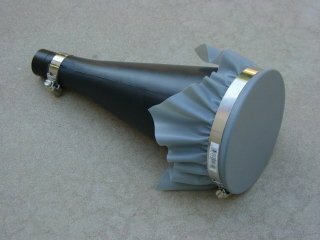 See the updated instructions directly at http://cdn.transitofvenus.org/docs/Build_a_Sun_Funnel.pdf. It’s good to see that Rick added some data. I had several emails with him, and it looks like all the questions I had are now covered.